I am an experienced harp teacher and performer. I have been playing the harp since I was 12 years old, and the piano since I was 5! I have extensive experience in music performance and education, including founding and running the Mesa Public Schools Harp Program. I love sharing my passion of all things harp music with my students at all levels and abilities, and I hope that I can do that with you! From October 1974 to May 2015 I served as the Mesa Public Schools Harp Specialist, instructing students in elementary, middle and high school. 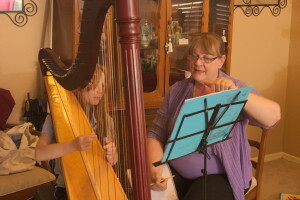 I also maintain an active private harp studio, teaching students as young as 4 years to adults. Many of my students have received collegiate harp scholarships, play professionally and/or avocationally and teach. I also have an extensive background in orchestral and chamber music. Additionally, I have an early childhood certificate of musical instruction. My own harp instructors include Mary Johnston, Ester McLaughlin and Suzanne Balderston with additional instruction from Clifford Wooldridge, Margaret Ling, Mildred Dilling and numerous workshops with additional artists and teachers. As a freelance harpist I have had many additional engagements including performances with local churches, weddings, receptions, dinners, corporate events and as a member of the Center Street Harp Duo. She’s a rock star, of all things harp! Patient and affordable. My girls LOVE her!